This article is about the Wes Farrell and Bert Russell song. 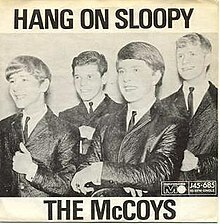 For The McCoys album, see Hang On Sloopy (album). "Hang On Sloopy" is a 1964 song by Wes Farrell and Bert Berns, originally titled "My Girl Sloopy", originally recorded and made a hit by R&B vocal group The Vibrations. It was later covered by rock band The McCoys, and peaked at number 1 on the US Billboard Hot 100 and number 5 on the UK Singles Chart. According to Rick Derringer, the original version of Sloopy was written by a "high school kid in St. Louis" and sold to Bert Russell, a.k.a. Bert Berns. The inspiration for the song is said to be Dorothy Sloop, a jazz singer from Steubenville and a student at Ohio University. "My Girl Sloopy" was first recorded by the L.A.-based R&B vocal group, The Vibrations in 1964, for Atlantic Records (45-2222). The song was a hit, reaching #10 on the R&B chart, and #26 on the US pop chart. In April 1965, The group's members were: Don Bradley, Carl Fisher, Dave Govan, James Johnson and Ricky Owens. The song then became a local hit in the Pacific Northwest in a cover version by James Henry & The Olympics (Jerden Records), but it was quickly eclipsed in August when the Indiana pop group The McCoys released their iconic retitled version. "Hang On Sloopy" went to #1 in the United States in October 1965. In early 1965, The Strangeloves, a New York City rock band, wanted to make the song the follow-up to their hit single "I Want Candy" and began performing the song in concert. However, the Dave Clark Five, with whom they were touring, told the Strangeloves that they were going to record their own version of the song when they returned to England, copying the Strangeloves' crowd-pleasing arrangement. The Strangeloves realized that the Dave Clark Five's version would probably outsell their own, but they weren't ready to release a new single yet because they were still enjoying the success of "I Want Candy" from a few months earlier. The answer presented itself when a young rock group named Rick and the Raiders opened for (and provided backing for) The Strangeloves in July in Dayton, Ohio. The Strangeloves — who were, in reality, three successful writer/producers from Brooklyn, New York — recruited Rick and The Raiders to release the song under their name. Their 16-year-old leader, Rick Zehringer, was flown to New York to record his lead vocal over The Strangeloves' already-recorded backing tracks. It was decided to change the name of Rick's group to The McCoys to avoid confusion with another popular band of the era, Paul Revere & the Raiders, and Rick himself began using the stage name Rick Derringer. The single was released on Bang Records and entered the chart on August 14, 1965, effectively beating the Dave Clark Five to the charts. The single went on to hit number one on October 2. Originally written and recorded with three verses, the newly retitled "Hang On Sloopy" was edited down to two verses for the single and resulting Hang On Sloopy album. The unedited three-verse version first appeared on the 1970 Bang various artists compilation Bang & Shout Super Hits (BLPS-220), then again on the 1991 Rhino Records various artists compilation Grandson of Frat Rock! Vol. 3 and the 1995 Legacy Recordings compilation Hang On Sloopy: The Best of the McCoys. The song gained an association with Ohio State University after its marching band began playing it at football games; it first played it October 9, 1965 after a staff arranger, John Tatgenhorst, begged the director to try playing it. After finally convincing the director, Tatgenhorst arranged the song and the band played it in front of the stadium. After the crowd reaction, the band began to play it at every game and now it is a Saturday tradition to play the song before the start of the fourth quarter of every Buckeye game. Since then, "Sloopy" has been appearing on the band's CDs and is available as a free download on its website. The song has also become a feature at the home games of professional sports teams throughout Ohio where, as is the case at Ohio State, fans usually chant the letters "O, H, I, O" during the pauses in the chorus while mimicking the shape of the letters with their arms and is normally played during the transition from the 3rd quarter to the 4th quarter at Ohio Stadium. At least one source includes a possible connection between the song and Charles J. Givens. Bruce Springsteen and the E Street Band also covered this song live in concert at the Schottenstein Center in Columbus in 1999 and on May 2, 2009 in Greensboro, North Carolina. Rick Derringer was still playing the song live with Ringo Starr & His All-Starr Band in November, 2011. In 2013, the Dj Offer Nissim made a remix of Porter's version, which became a big hit in the club scene. When The Rolling Stones played Ohio Stadium on May 30, 2015, as part of their Zip Code Tour, they included the song on the playlist as a tribute to the local Ohio/Ohio State fans. It has been designated as Ohio's official rock tune. Little Caesar and the Consuls released a version of the song in 1965 that reached #50 on the Billboard pop chart. "Hang on Sloopy" served as the title track of a live 1965 recording (released on Rhapsody in 1966) by the Ramsey Lewis Trio; the disc became a gold record. It reached #6 on the US R&B chart, #11 on the US pop chart, and #18 on the US adult contemporary chart. A cover in Spanish titled “Es Lupe" by Los Johnny Jets released in 1965 topped the Mexican charts for 13 weeks. The Lettermen released a version of the song in 1970 that reached #18 on the US adult contemporary chart and #93 on the Billboard Hot 100. Rick Derringer released a version of the song in 1975 that reached #94 on the Billboard Hot 100. The Sandpipers released a version of the song in 1976 that reached #32 on the UK Singles Chart. A 1973 cover version by Ramsey Lewis won the Grammy Award for Best R&B Instrumental Performance in 1974. It was also recorded by Ric Mango of Jay and The Americans and Johnny Maestro & the Brooklyn Bridge as a duet for an uncompleted album project. It was released on a 2011 CD titled The Ric Mango Story. It has also been performed by Johnny Thunders and the Oddballs in a medley with "Louie Louie" and can be heard on the Add Water and Stir live Japan bootleg. The basic riff of the song became a staple of garage bands during the 1960s, being used on such songs as The Weeds' "It's Your Time" and Kit and the Outlaws' "Don't Tread on Me". A parody named "Hang On Snoopy" was included on Swiss rock group Patent Ochsner's 1994 album Gmües. Prior to this, a "Hang On Snoopy" parody was used in The Royal Guardsmen's hit single "Snoopy vs. the Red Baron", but was removed after copyright threats. There is a character in the novel The Wanderers by Richard Price named "Hang On Sloopy". The song also appears in several Peanuts cartoons but the words are altered slightly to "Hang On Snoopy". The family of the late Bert Russell Berns call their music publishing company Sloopy II Music. The band Islands uses the chorus in a B-side named "Two Dogs". Jonathan Richman references the song in the song "Parties in the USA" in his 1992 album, I, Jonathan. "WHEREAS, "Hang On Sloopy" is of particular relevance to members of the baby boom generation, who were once dismissed as a bunch of long-haired, crazy kids, but who now are old enough and vote in sufficient numbers to be taken quite seriously..."
"WHEREAS, Adoption of this resolution will not take too long, cost the State anything, or affect the quality of life in this State to any appreciable degree, and if we in the legislature just go ahead and pass the darn thing, we can get on with more important stuff." "Hang On Sloopy" is also a signature song for Major League Baseball's Cleveland Indians, who play at Progressive Field in Cleveland, Ohio, traditionally playing the song during the middle of the 8th inning. The song also plays at the end of the 3rd quarter at FirstEnergy Stadium during every Cleveland Browns game, and is also played at Cleveland Cavaliers games at Quicken Loans Arena. During games it is common for fans to yell "O-H-I-O!" following the chorus. ^ Nick Talevski (May 8, 2006). Knocking on Heaven's Door: Rock Obituaries. Omnibus Press. p. 273. ISBN 9781846090912. ^ Frank W. Hoffmann (November 1, 2005). Rhythm and Blues, Rap, and Hip-Hop. American Popular Music. Facts on File. p. 141. ISBN 9780816073412. ^ Liner notes to "The History of Northwest Rock, Vol.2"
^ Liner notes to "The Best of The McCoys"
^ Setzer, Luke. "Lessons from a Dead Millionaire". Basic Manual Speech 7: Apply Your Skills. Retrieved October 4, 2011. ^ 'No Embalo da Jovem Guarda', 1999, by Ricardo Pugialli. Ampersand editors, RJ, Brazil. ^ "Hang on Sloopy". Youtube. Retrieved April 24, 2019. ^ "Show 50 - The Soul Reformation: Phase three, soul music at the summit. [Part 6] : UNT Digital Library". Digital.library.unt.edu. Retrieved 12 November 2017. ^ "Ohio's State Rock Song - Hang On Sloopy - Ohio History Central". Ohiohistorycentral.org. Retrieved 12 November 2017. ^ "Stadium Songs: Cleveland Indians". Espn.com. Retrieved 12 November 2017. ^ "Ohio State University celebrates 50 years of 'Hang on Sloopy'". Fox8.com. 7 September 2015. Retrieved 12 November 2017. Eric Lyttle. "The Real Story of Hang On Sloopy." Columbus Monthly. September 2003. Bob Shannon and John Javna. Hang On Sloopy – The McCoys, Behind the Hits. New York: Warner Books, 1986. p. 228. This page was last edited on 25 April 2019, at 01:11 (UTC).